十 = 二十 - 十 is 10 = 20 - 10 in Chinese or Japanese. 1.5 + 2.333… = 3.8333…, which is equal to 23/6. 100 is a big square, as it is 10*10 (which is bigger than 001). 6E1 is scientific notation for 6 * 10^1 = 60. The two parenthesized multiplications are both matrix multiplication. 1*5 + 2*2 = 9, and 4*4 + (-1)*(-2) = 18, where the T in the exponent is actually a transpose operator. The Unicode code point for the capital letter J is U+4A. This is a series of flag semaphore letters, which when translated spell out the answer, REVOLVER. If you enjoyed this puzzle, you should take a look at Mathsticks, from the 2018 Caltech Puzzle Hunt, which was our inspiration for writing this puzzle! While doing research for this puzzle, we discovered that there seemed to be a dearth of crazy instances of the genre online - most instances involve making some number of squares, or satisfying some basic arithmetic equation. 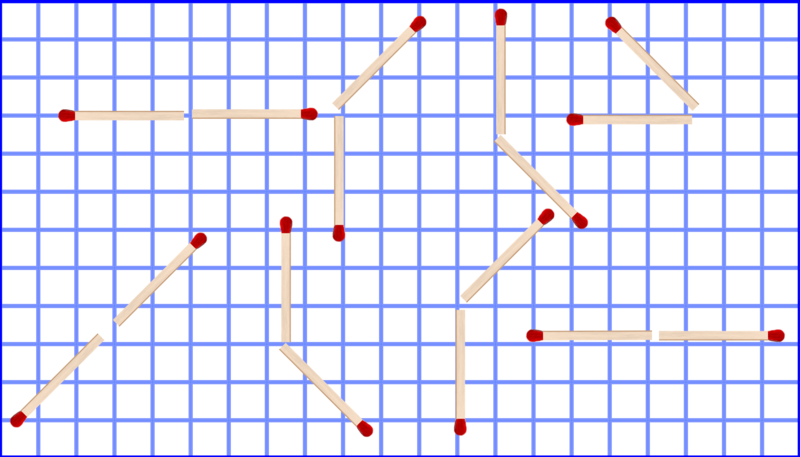 While writing this puzzle, we tested each of the matchstick puzzles internally to determine whether the canonical solutions felt fair once solvers found them. As an additional fun fact, this puzzle involves the most image "layers" of any puzzle in the hunt, even surpassing Where Are They?